When It Rains, It Pours. Over. I'm not too quick on the uptake sometimes. It's been relatively dry here in southwestern Pennyslvania these past few days. Cloudy and cool, but no rain. So I'm not sure why it made no impression that for several days I've had a steady drip, drip, drip, from the downspout that feeds my rain barrel. It's been so persistent it's left a greenish algae slick on the wooden barrel's top. And why did I not think it alarming or unusual when, the last time it rained hard, the gutter on the west side of my back porch was overflowing? It was raining hard, that's what I figured. When there's more water than the system can take, overflows happen. Anyway, I had plenty of water in the rain barrel-- until I used most of it the past few days watering the crucifers, tomatoes, peppers, and other vegetables I've just planted. So when it started to rain about an hour and a half ago, leaving aside the fact that I'd never gotten out to mulch up the rest of last year's leaves for the pepper and cucumber bed, I was very glad. Hurray! drinks all round for the grass and the plants and a refill for my rain barrel! Or not. Kept waiting for the water to come gushing down the spout, and nothing was happening. The deluge got harder. Still nothing much into the barrel. But oh! off that west porch gutter! Floods! waterfalls! inundations! tidal waves! Uh, Kate? Ever occur to you that something up there might be-- is-- blocked? Whatever's gotten stuck, it's underneath the wire gutter guard. A view out the third floor window tells me the guard is intact. And by knocking as far as I can up the downspout, I've determined that it's clear, towards the bottom, at least. Oh, fun. This means a trip out on the roof. Adventures! I've never done that before. I've got a handy window for it, but it'll need to wait till things dry out again. And until I can draft a spotter. Life's interesting enough without me breaking my neck falling off the top of the back porch. 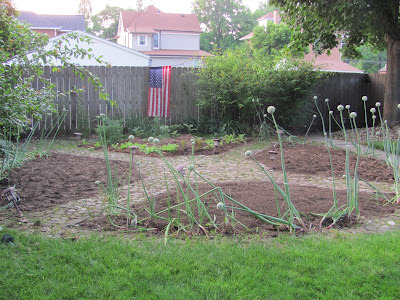 The past three days I've been getting the rest this year's vegetable garden planted, and there's a bit of a story behind that. And the story is that I did not exactly do it on my own. So credit and thanks will be hereby given where they are due. In the first place, I didn't do the heavy digging this year. Or at least, not much of it. I wasn't allowed to do anything of the sort until the 2nd of June, when my doctor cleared me for regular activity. And then I had enough to do getting the potatoes moved. My dream-- my fond, fantastic dream-- was that I'd locate some friend or neighbor who had a small rototiller that could do my small kitchen garden beds without tearing up the cobblestone paving. This was rather necessary for my purposes, since as I've posted before, my vegetables share the yard with two large maple trees. They simply love getting their roots in the beds and cumbering up the dirt, and any vegetable starts just popped in would face too much competition. My friend Frieda* thought her husband might know someone who had a small rototiller, and the idea was to get whoever that was to come over and do my garden before the end of May. Didn't happen, couldn't happen. This friend of a friend and his rototiller was too busy. But a week or so ago, Frieda's husband found an old gas rototiller in the back of their garage. And with a little tuning up, it worked! And this past Sunday, while I was at church, they came over and churned the soil over. I have to admit I was disappoin- ted in my hopes for a completely maple-root-pulverized garden. Obviously, the tiller tines don't go as deep as I'm used to plunging in my garden fork. But often as not, whenever I yanked on a root, it came loose. So the machine got in there and cut more than first appeared. The three beds still needed weeding around the edges and some general forking over, but the worst of the job was done for me. So I thank Frieda and her husband, but that isn't the extent of the debt of gratitude I owe. 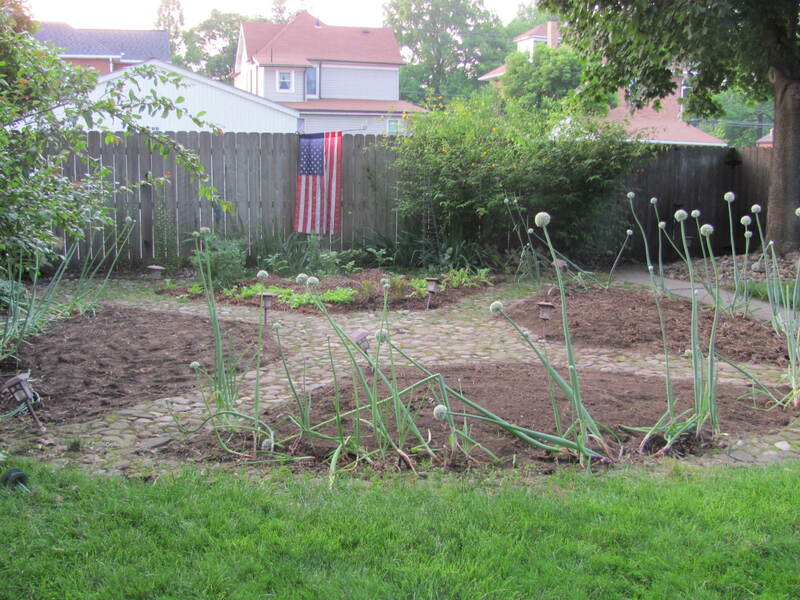 For barring the onions and the leeks that've been dividing and going to seed around the edges the past two or three years, all the plants in these three beds were given to me by an elder in my presbytery who owns a garden center and nursery over in Butler County. He went through surgery and chemo for Stage III colon cancer three years ago and graciously said I could have whatever I wanted. I drove out to Quality Gardens last Thursday to pick up my haul, and came away with an amazing variety of plants. As I mentioned, I took three days planting them all, starting Monday evening. I don't want to turn this into a cancer blog (feh! ), but it turns out that you can't go full speed gardening after a five hour dose of chemotherapy. South bed: Crucifers-- "Premium Crop" and "Romanesco" broccoli and Brussels sprouts (variety not tagged). West bed: Tomatoes-- Big 'uns "Brandywine Pink," "Cherokee Purple," and "Mortgage Lifter" (I wish! ), then "Yellow Pear," "Small Fry," and "Ildi," the last three all grape/cherries, then "Speckled," a paste tomato I may not have given enough room. East bed: Cucumbers-- "Sweet Slice," "Diva," and "Muncher." Sweet peppers-- "Lady Bell" (I'll let mine go red) and "Mohawk." And in the border at the front of the house (yes! ), "Bambino" miniature eggplant and two starts of broccoflower. Should have been three, but my greedy beast dog ate one! I love the heirloom names. They bring up such an idiot sense of romance in me. And as I've learned in the past, the taste will give me even more to love. So thank you to Tom as well, and I hope the yield I get pays him for his generosity. In the kitchen garden, that is. No time to do a full post: I have to get to bed at a somewhat decent hour, since I'm due to start my first round of chemotherapy in the morning and I need some sleep beforehand . . . If you took a look at the diary/organizer on my computer, you'd see for today's date a long list of To-Dos pertaining to sanding and shellacking my 2nd floor hallway floor. You'd also see that most of them are in red, meaning I meant to have them done before this. In some cases, long before this. Some of my lack of progress I can blame on my car. It celebrated my return to driving last week with problems with its brakes, computer software, and a belt or two. Some of my failure to check things off the list is my own damn laziness. Gah! I love being online and linked to so many people all over, but I sure got a lot more done when I'd never heard of the Worldwide Web. Currently, however, the main reason I'm not working on the floor is because I've taken a step back to do the steps to the 3rd floor first. Makes sense, really. Can't you just see me, hallway floor all beautiful and finished, and here I come splashing paint remover all over it as I work on the stairs up to the study. Serious work started yesterday, with the peeling back of the carpet that lipped over the nosing at the top of the stairs. Needed to be out of the way to get the riser stripped. Oy! was that a chore. More staples per inch than a general store. They were the little ones, too. The carpet edge is a mess and I refuse at the moment even to think of how it'll be to put it back, but for now a couple of bricks are keeping it out of the way and that's what matters. Started in with the heat gun yesterday afternoon. My experience stripping the old shellac off the three lowest treads told me that the paint on the stringers gets pretty messed up. Add to that the strange texture the stringers acquired from paint cut in around carpet, and that equalled stripping the stringers, even though they'll be painted again. The paint on them isn't really cooperating with the heat gun. It gums up and has to be gone after with a toothbrush dipped in refinishers. Today I discovered that if I heat it till it bubbles and let it cool down, I can scrape most of it off cleanly with a dull razor blade scraper. Funny, that only works where there's two coats. Otherwise, it's back to rearranging the goop. Shades of the plaster repair work I was doing a year ago: I found out today that it wasn't such a good idea to carelessly let the Big Wally's PlasterMagic adhesive just drop on the stairs (on the theory that I was going to refinish them Anyway). It's not that it's resistant to the heat or the refinisher, it's just that getting the plasticky globs of it off the treads prolongs the process and makes a mucky mess. Without it'd I'd have more to show for today's labor. Made some progress this afternoon with the refinisher, then more with the heat gun after supper. The idea is to do the heat application and the liquid refinisher in stages, so I can bring my tools down with me and not go clomping up and down wondering where I put things. The idea was also to get the whole stairway done before I went to bed tonight. But a little after 10:00 I reflected that I'd have better light for it tomorrow. Besides, I've been fighting a terrible case of the munchies all evening, and if I stay up much later I'm sure to go downstairs and eat large amounts of ice cream or something. The project's going, at least. I've had second thoughts about the necessity of stripping the stringers, but too late to turn back now. Don't know how much I'll get done tomorrow: I've come by some vegetable starts for my garden and really need to plant them before my dog eats them as they sit on the back porch. I've had to rescue a Brussels sprout seedling already. Am I the only one who does something with her house reno or in the garden, and then spends hours afterwards on the Internet trying to confirm if she did it right? Even if the thing is done and not about to be undone? Today I transplanted potatoes. (It's nice being cleared to exert myself again!) If I'd done a better job last fall digging my potato crop, the matter wouldn't have come up. But I didn't get them all, and it did. Or they did. Come up, I mean. Potato plants, in all their green, promising glory. Couldn't leave them where they were. Don't they say not to plant potatoes in the same place two years running? Time for relocation. Besides, that south bed looked terrible. I got a late start mounding my potatoes up last year, and when I got around to it I made a cage of sorts with green plastic chicken "wire" stapled to wooden stakes all round. Then I dumped into it all the finished compost I had. Towards the end of last year, when I took the enclosure down, the composty-dirt stayed put, but oh! wasn't it lumpy and bumpy--! Not to mention encroaching a good way over the edge of the garden path. The bed was a mess, netted with weeds, edged with two-year-old red onion plants going to flower, and here and there, some volunteer leaf lettuce and the volunteer potatoes. Well, too bad. It's done. I put the seven young plants into the north bed, in a more or less symmetrical arrangement with the three towers of snow peas I already have there, mounded them up with some of the excess dirt from the north bed (probably another no-no?, and mulched them in with last fall's ground-up maple leaves. But given that I used the volunteers, did I transplant them right? The sites that talk about transplanting (I think they're assuming potatoes from seed) say you're supposed to put them in the garden at the same level they were in the pot. Oh, dear. The four biggest volunteers were nearly 16" high and looking to get taller. Sorry, I don't want my garden to look like I've buried a giant in a shallow grave. It's too small for that. I dug those holes down deep in my sandy soil and once I had those plants in, I wished I'd dug the holes even deeper. With the mounding I had to do, that bed's already looking like Paricutin redux. Hurray, baby potatoes! I carefully pinched them off and put them in the harvest basket for dinner. I figured that the transplants needed to use their energy for the next little while to get reestablished; making potatoes will come later. But the Intertoobs say the spuds just begin to form when the plant is in bloom. My plants have buds-- but no blooms yet. They also say that if you harvest potatoes when they're new, you won't get many more off that plant. But isn't that why I planted potatoes last year in the first place-- so I could get really fresh, really new taters? I didn't eat all the mature ones I stored last year, anyway. Of course there were all those pimples on the leaves of the two medium-sized transplants . . . They didn't seem to be affecting the shape of the leaves or the overall vigor of the plants, so in they went, anyway. Haven't been able to find anything online yet to make me second guess my decision about that; maybe there'll be something in one of my gardening books, which I'm too lazy to run downstairs and fetch. It looked like an insect problem rather than any sort of disease, but did I violate yet another potato-planting rule? Never mind! I had a panful of lovely little buttered potatoes for supper tonight. And whatever I in my potato-growing nescience may have done today, I recall last year when I did so many things wrong-- like using sprouted supermarket spuds in the first place-- and it all came out so delightfully right.